I’ve been playing make believe again. This time, I’m pretending it’s spring, full on flip-flop and flowers weather. And it was for a few days — sunshine and glorious temperatures. But outside my window now, it’s cold and raining, turning to sleet later. But I don’t want to talk about that. 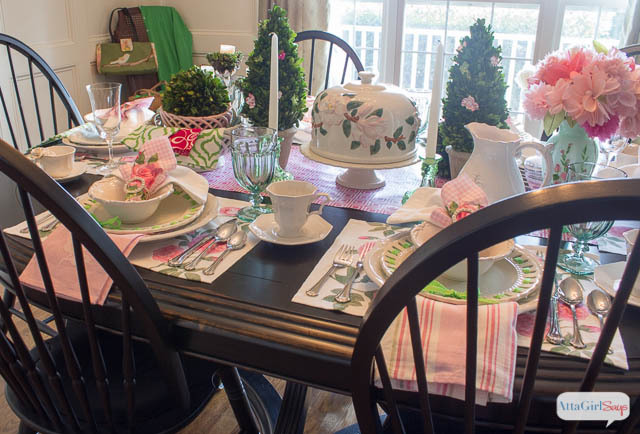 I want to show you the pretty table I created, perfect for a ladies’ luncheon, shower or bridesmaids’ tea. Could you tell they weren’t the real thing? In my mind, I have been referring to this as the tablescape where everything matches but where nothing does. 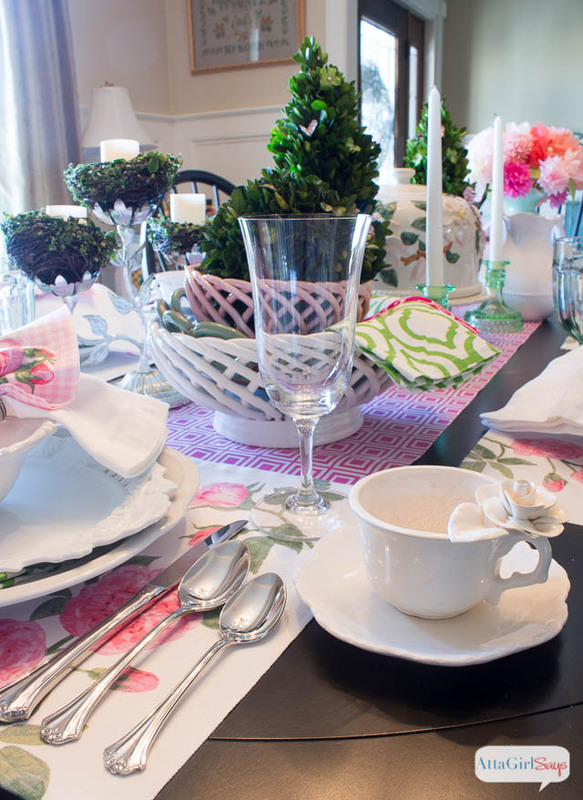 I love to scan catalogs, magazines, Pinterest — and even wedding websites — for table setting ideas. But so often the looks are impossible to achieve without a huge budget. 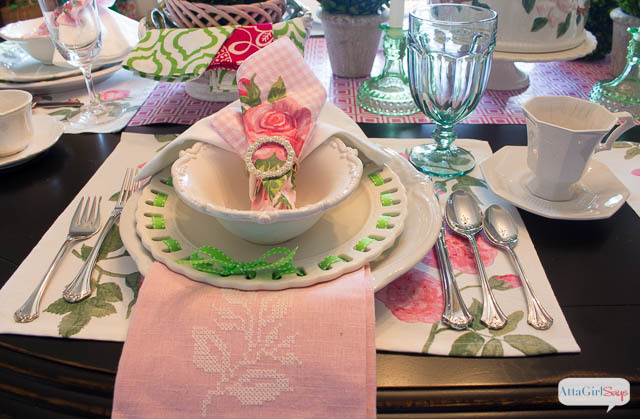 But you don’t have to have a full six- or eight-place settings of china or silver or all the coordinating serving pieces to set a beautiful table. One of my favorite creative challenges is to open up my cabinets and look at my everyday dishes and bowls in a new way. I also like to shop my house — and sometimes even my closet — to see what I can find to match my theme. It helps to have a bit of a home decor stash and some collections from which to draw. 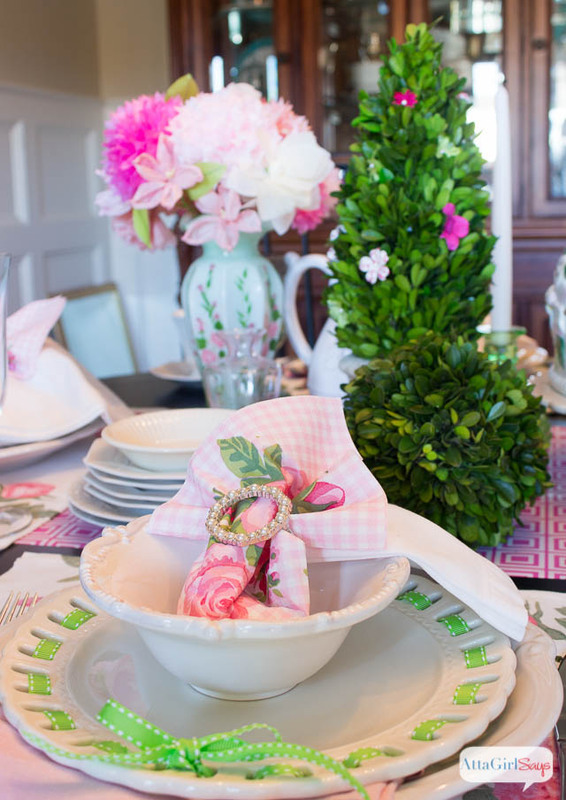 But most of what I used to create my girly pink-and-green spring luncheon was not purchased at full retail price, but rather picked up at clearance sales, auctions, antique shops and Saturday morning yard sales, one of my absolute favorite springtime activities. I did have six matching placemats from Ikea and some coordinating paper napkins. But I didn’t have enough accent plates or glasses or even cloth napkins to complete the tableau. So, I mixed and matched, pulling out everything pink, green and white I own. Goblets and butter dishes and cake domes. Which got dressed up in pretty pink and green flowers, left over from this Valentine’s Day craft project and some wedding programs I made years ago. 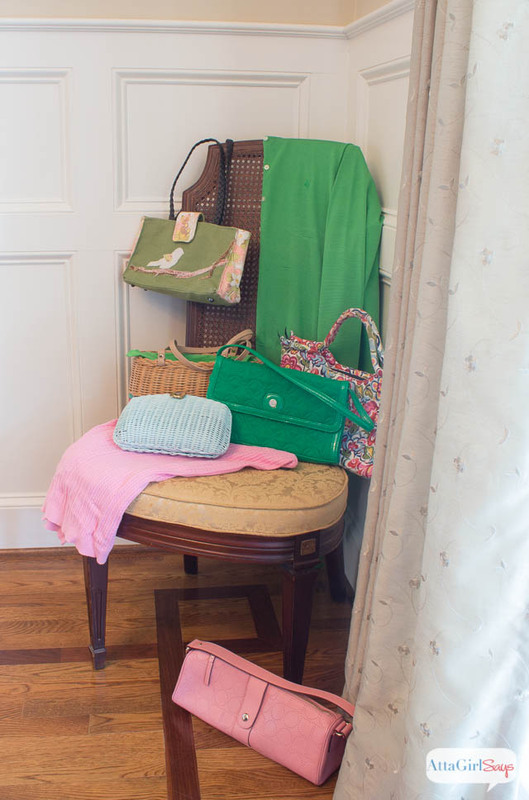 And draped some of my favorite springy and preppy sweaters and purses on a chair. 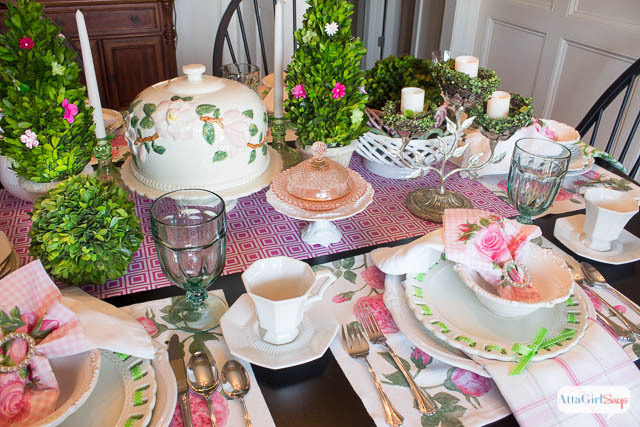 This last little detail left me so inspired I’m planning to invite some ladies over soon for a pink-and-green luncheon to celebrate spring. 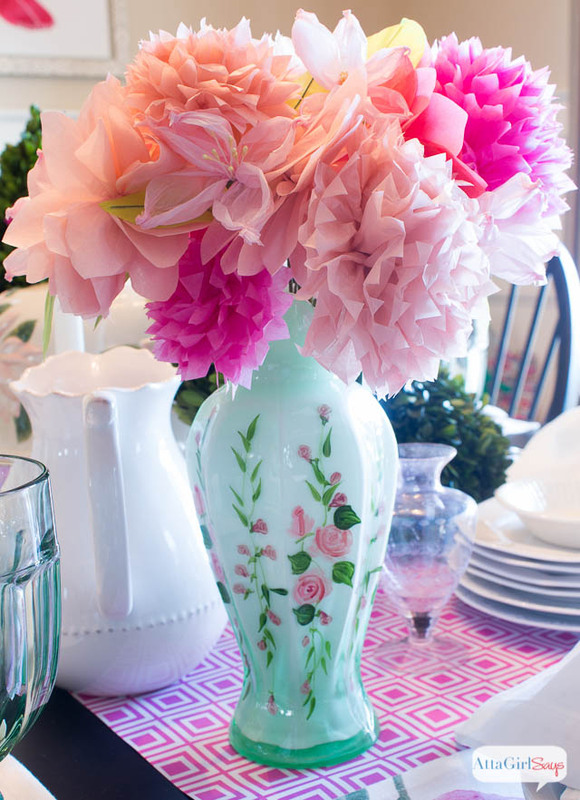 Because a table this pretty shouldn’t just be for looks. Why create it if you’re not going to use it. 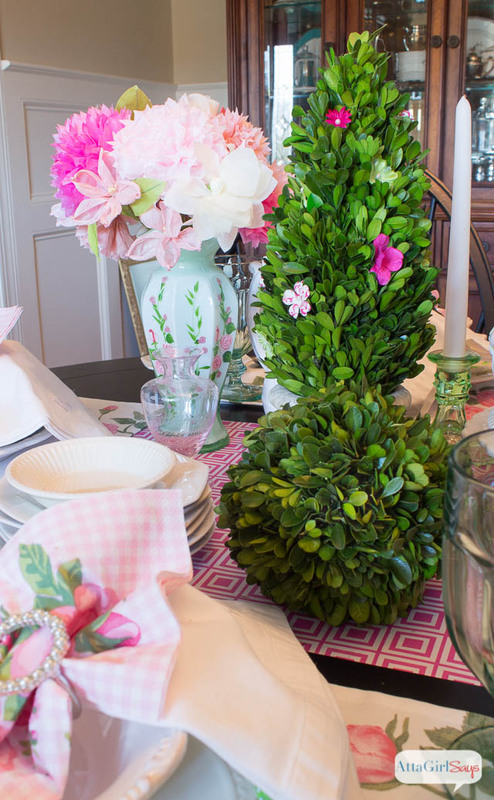 No matter what the weather is outside, it will be spring inside! If you have major spring fever like I do, be sure to stop by tonight at 6 p.m. EST. 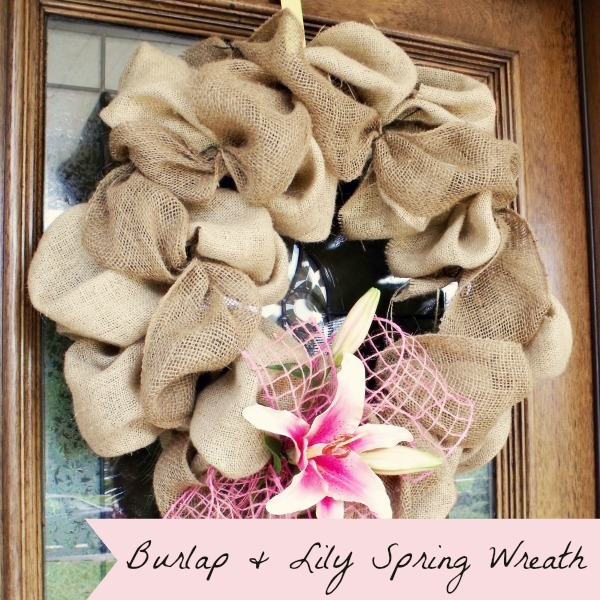 For the Scoop’s Mega Spring Linky Party, which will be cohosted on more than 35 blogs. 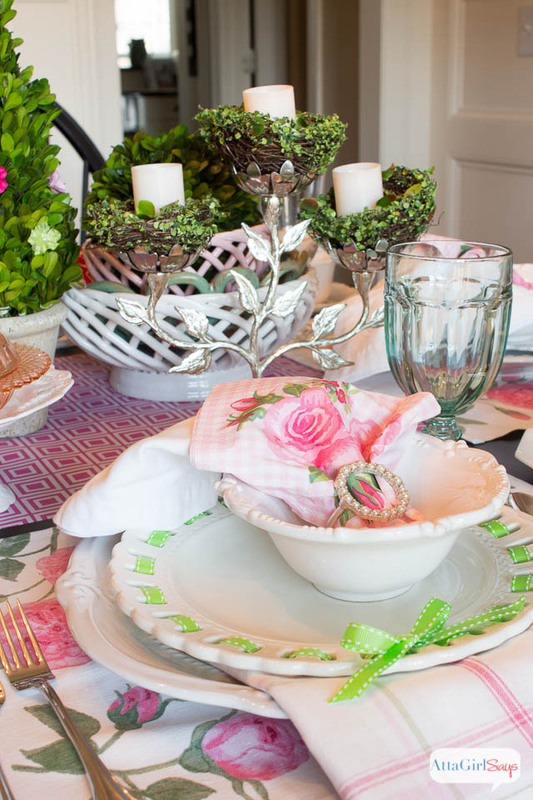 We’re talking hundreds of spring crafts, recipes and decorating ideas. 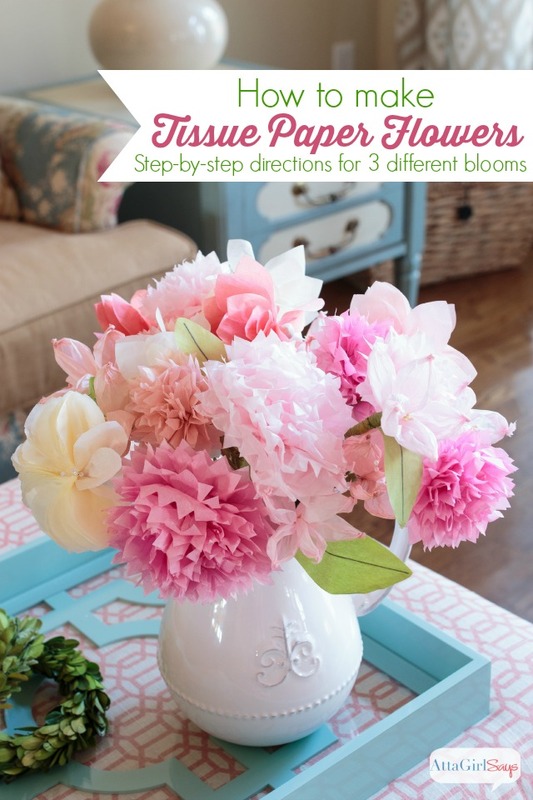 If you’re a blogger, this party is a great chance to showcase your spring projects to a huge audience. 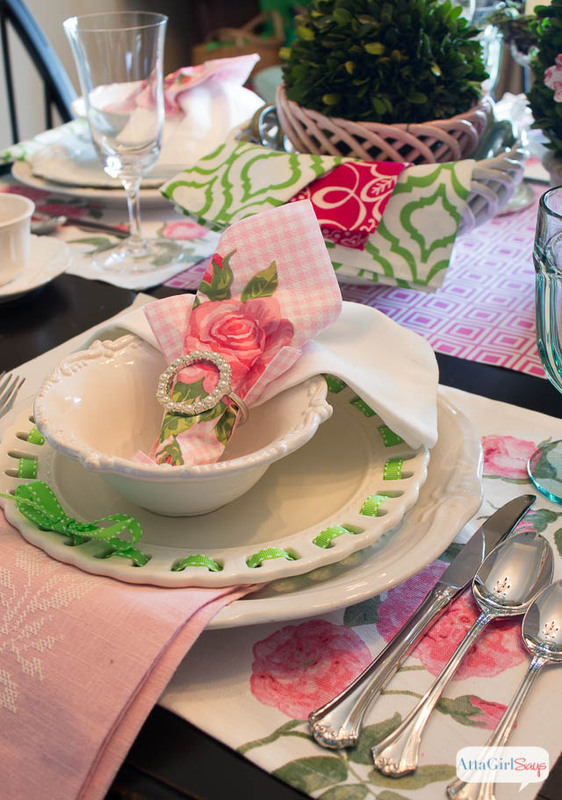 Until then, here are a few of my favorite spring projects and table setting ideas. Your table looks so pretty! 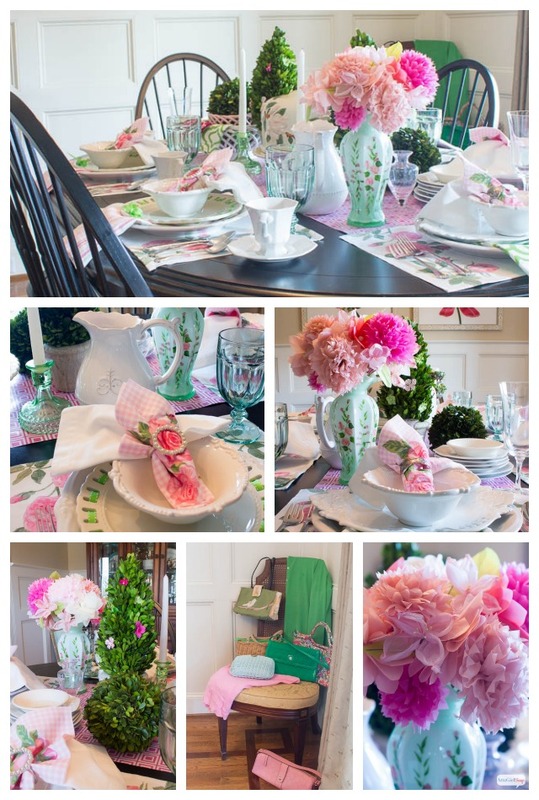 Pink and green are perfect colors for a ladies luncheon. I wish I could put on a cute dress and come over to socialize. This weather is crazy! Yesterday I was in a short sleeve shirt and today it’s pouring down snow. I think we all are ready for spring. Same here, Paula. It was absolutely gorgeous weather yesterday and today it is sleeting. They just dismissed school and temperatures may get into the teens overnight. But I think it will be in the 60s or 70s by the weekend. I’m hoping! 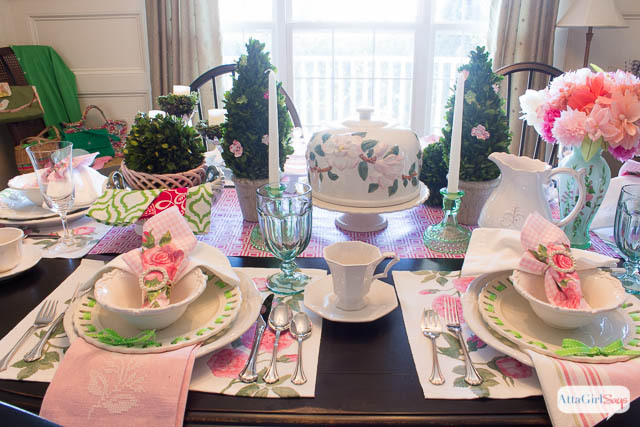 Amy, your table looks so pretty dressed in pink! 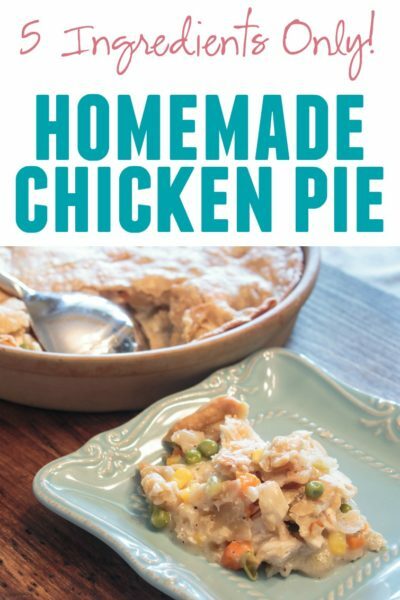 I’m posting about a recipe that would go perfectly with your spring table!!! Just lovely, Amy! In my mind, I was right there with you at the ladies luncheon. I’m the one wearing the delicious green sweater and carrying the pink and green floral pocketbook! You’ll be invited to the real thing, for sure, Suzy. And I’ll even let you borrow my bag and sweater! I was pleasantly surprised myself, Vidya. And I’m so excited about this party. Spending some time now checking out my cohosts’ posts and some of the links. 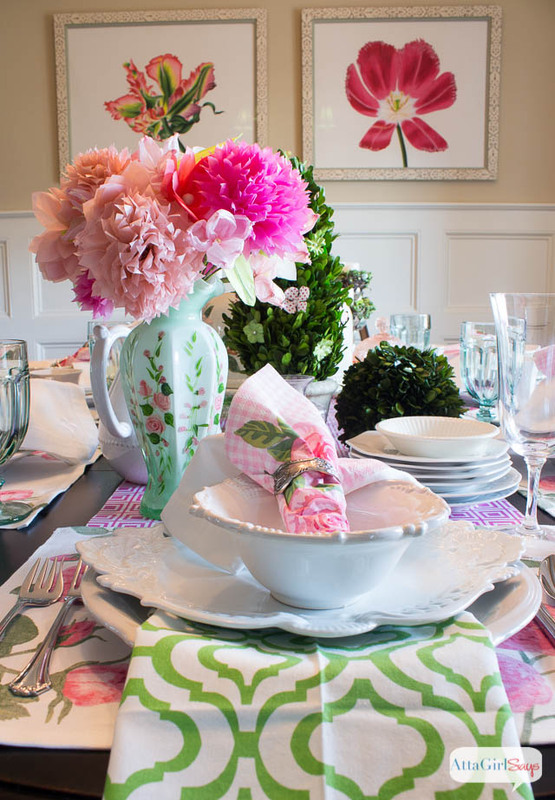 Your pink and green tablescape is lovely. 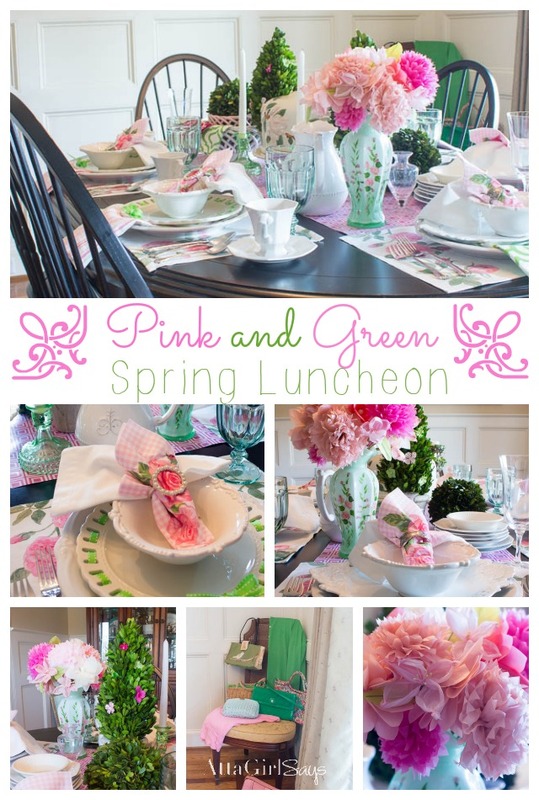 My favorite color combination has always been pink and green. I’ve always been a pink-and-green girl, too. 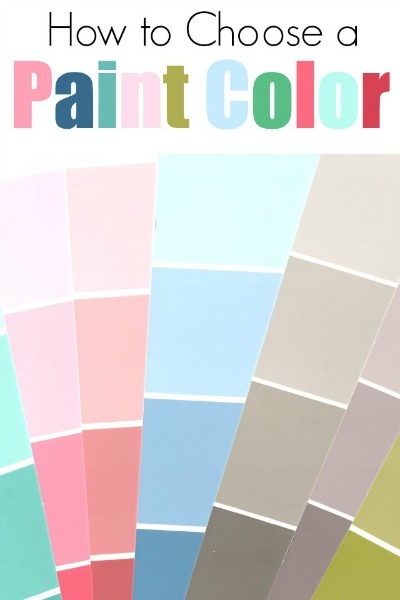 I’m currently redoing my office in shades of pink, green and aqua, and my favorite wardrobe colors are pink and green, too. It’s clearly an obsession. This is so bright and cheerful! Love it. It’s just gorgeous! I love your thrifty mix and match style. I can see you’re totally going to tempt me at Ikea this weekend! I do love the pink and green and the pics are perfect! 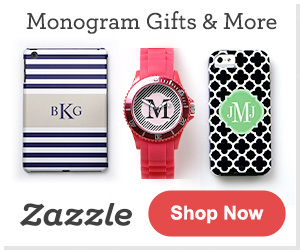 Oh my goodness, I just found your blog and love it! 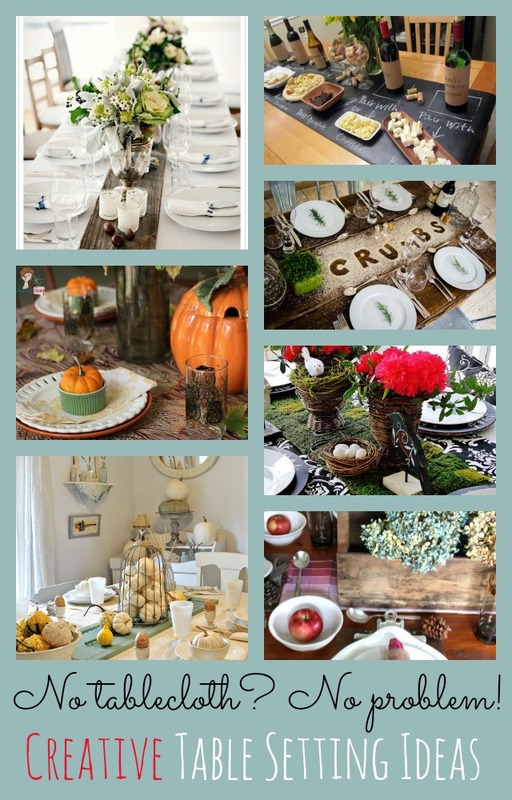 What a beautiful table and neat ideas. Please let me know what pattern your bowl is that you set your table with. It is the pattern that has the pretty napkin in it. I absolutely love that pattern and have to get my hands on it! I can’t wait to keep up on this blog and thank you so much! Thanks, Dawne. Luckily, I bought this table already painted, but painting my kitchen table and chairs is on my to-do list for the spring. I’m not looking forward to it because I have windsor chairs! Amy, your table is simply beautiful! 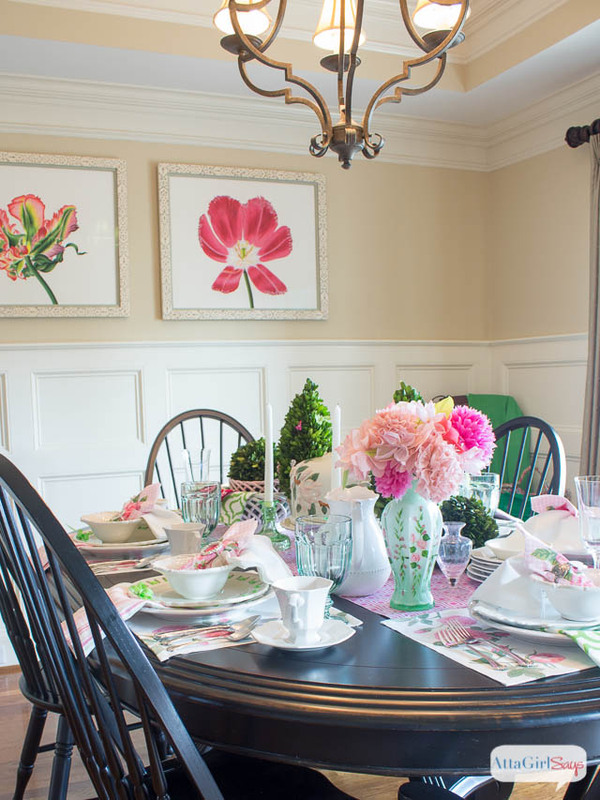 Love the pinks and greens throughout. 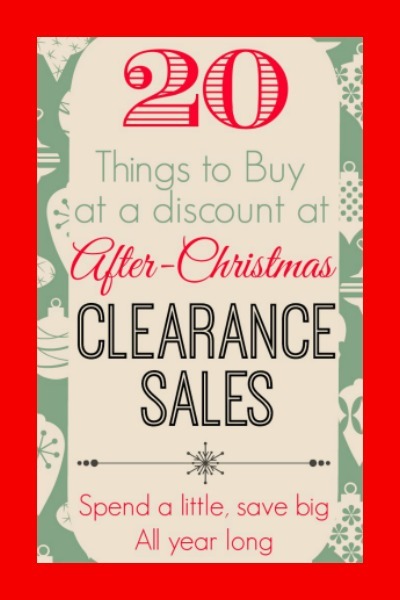 We’d love to see you share this on Merrymakers at Simply BeBetsy – it would be perfect! such a cute table!! Very Lily P’esque!! You did a nice job of mixing and matching! Looks great! Atta girl! Your table is stunning and I adore all the pink and all the Little trimmings in the reticulated plates. Gorgeous for spring. 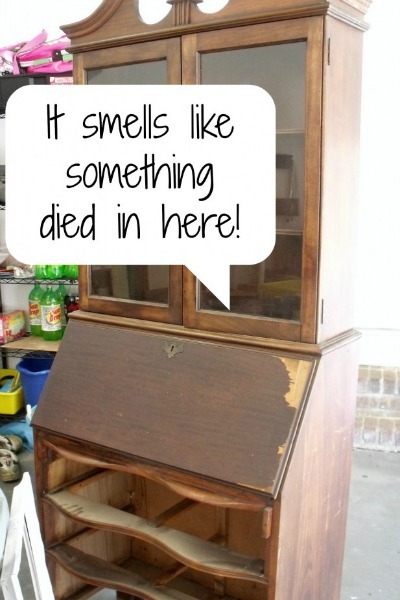 I can just keep on looking at all your lovely elements you’ve used to créate this table. Pink and green are my favorite colors! I just love your Spring table! 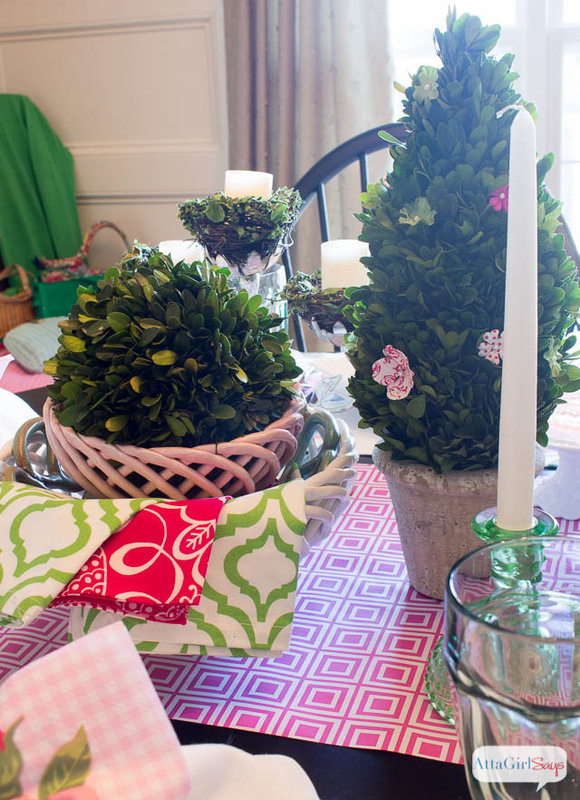 What a lovely, festive and fun table. 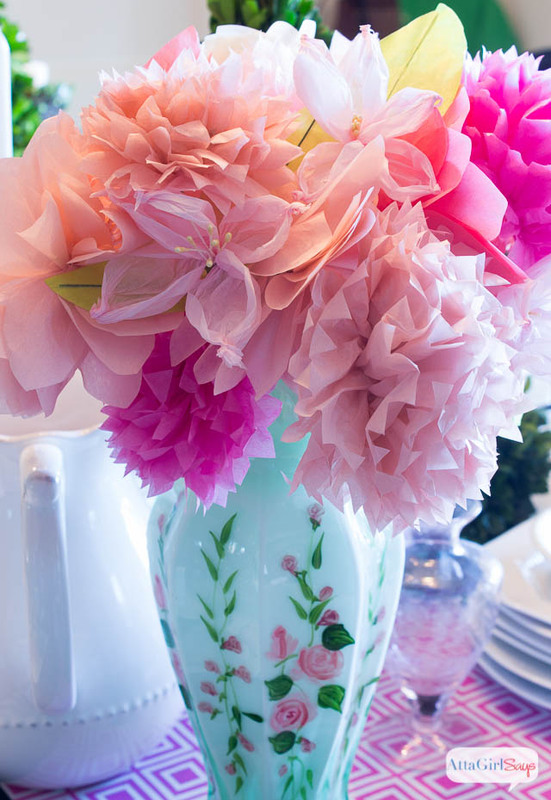 A true visual delight…………love the colors, so fresh and pretty. I love pink and green! I am a dishaholic, but buy in 2s and 4s so I have lots of things to mix and match without spending a fortune~shopping the house is such a good idea, its fun to challenge yourself that way! 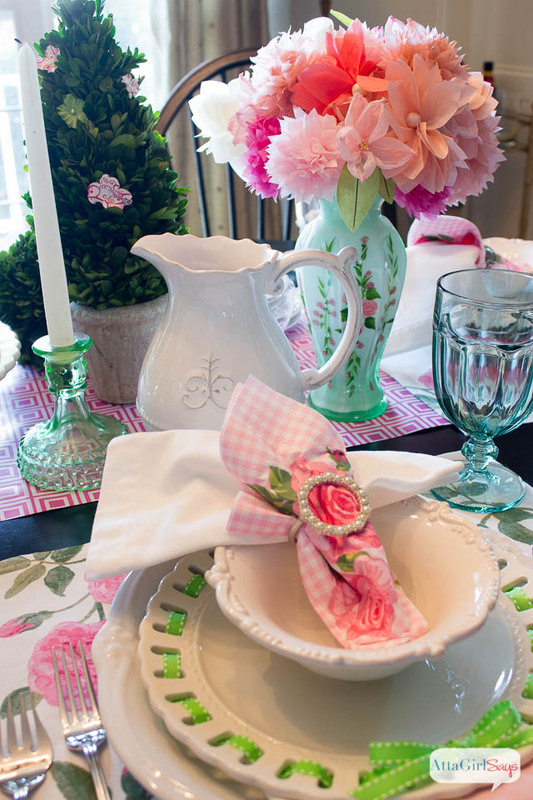 Love the way you have found so many things to unite in this pretty setting! 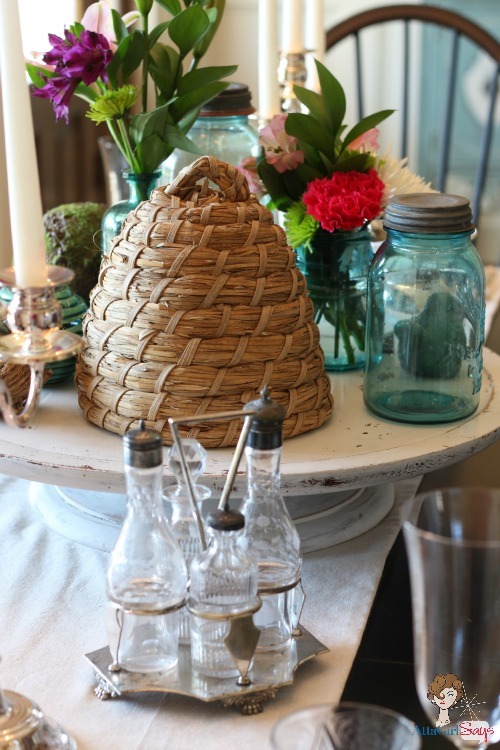 Lovely table display! Your ideas are fantastic! 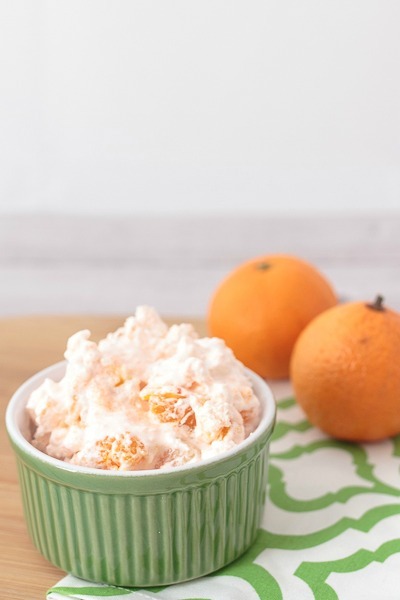 Thanks for linking up with our Pure Blog Love Linky Party. It begins again Thurs at 8 p.m. EST. It would beer great to see you there. I’m hosting at my site. Have a good day!